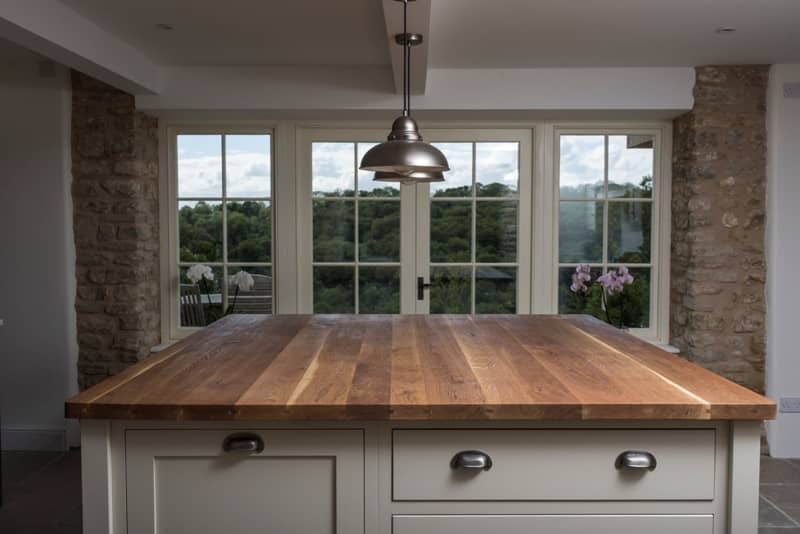 This characterful period home is set on a wooded hillside overlooking Avoncliff Mill. 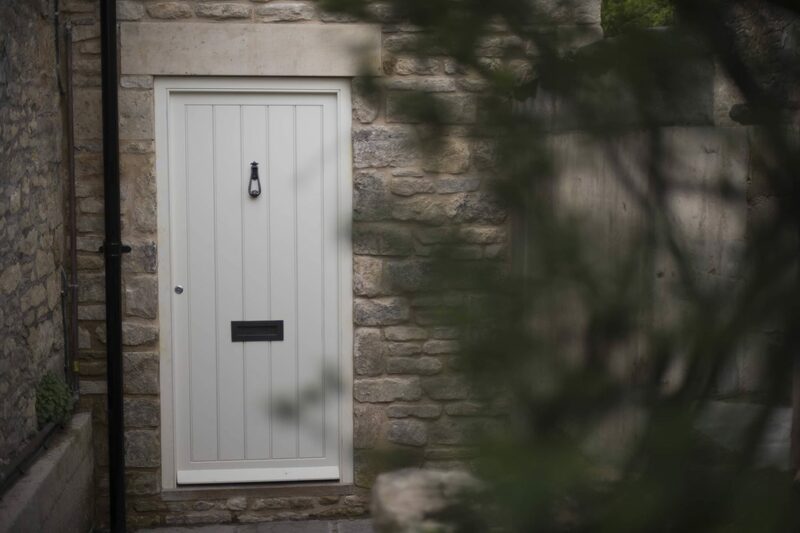 One such project was for a family who own a house in Turleigh on the edge of Bradford on Avon not far from our workshops. 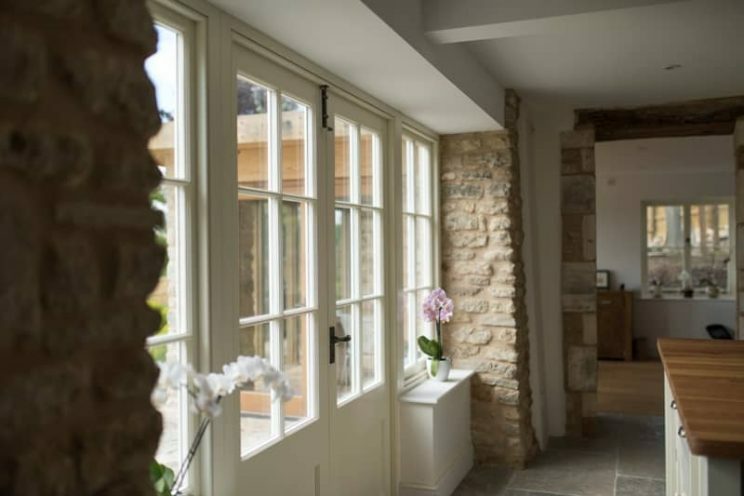 Their characterful period home is set on a wooded hillside overlooking Avoncliffe Mill and Upper Westwood. 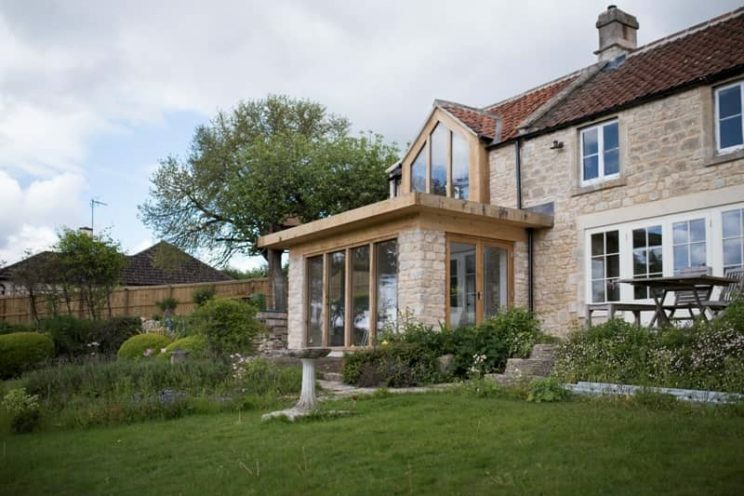 It’s an idyllic setting and they wanted to add a contemporary but sympathetic extension to incorporate a living area and dining room. Credit to Hetreed Ross Architects for its beautiful design. They already owned one of our rustic oak farmhouse-style kitchen tables (designed by Mia Marquez) and made by the Bath Bespoke team here in Winsley, and the additional space they had in mind took its design cue from this table which is a real focal point in the layout. 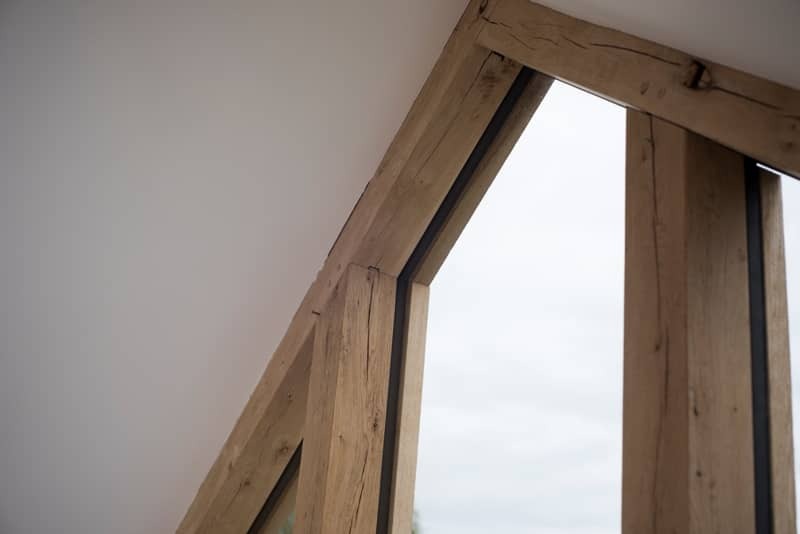 We were commissioned to design, make and install all the joinery, starting with a robust green oak framework to the room, juxtaposed with solid Accoya timber painted windows, french windows, doors and a work surface. 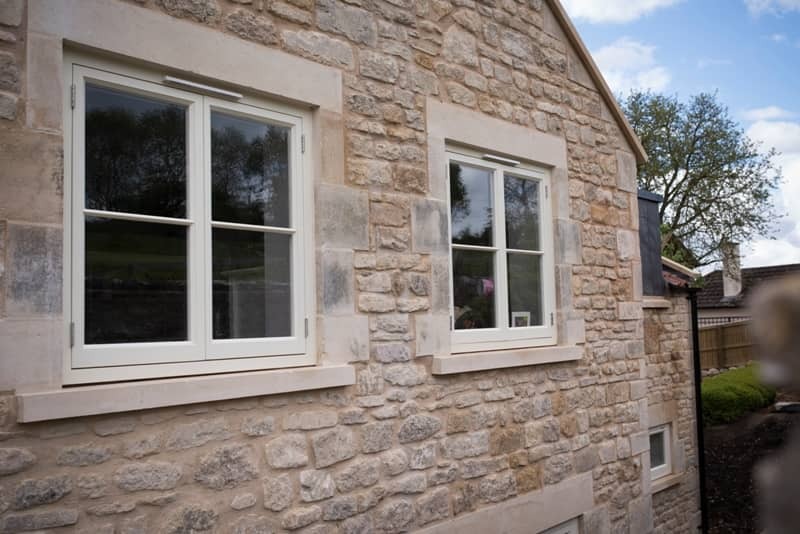 Working closely with our clients and their architect to make all the key decisions we mixed up the styles within our work, with some sleek, contemporary elements and some period style mouldings to complement the exposed stone. 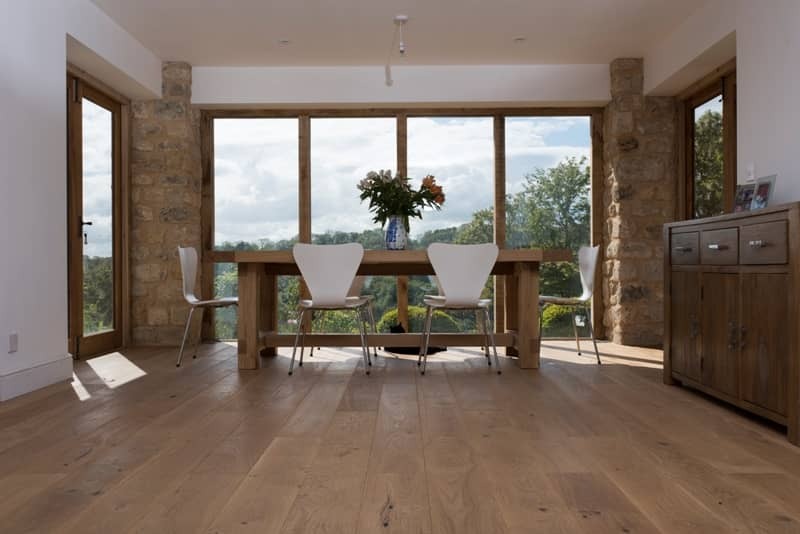 We also supplied and laid 80m of solid engineered oak rustic wood flooring in the main living area. 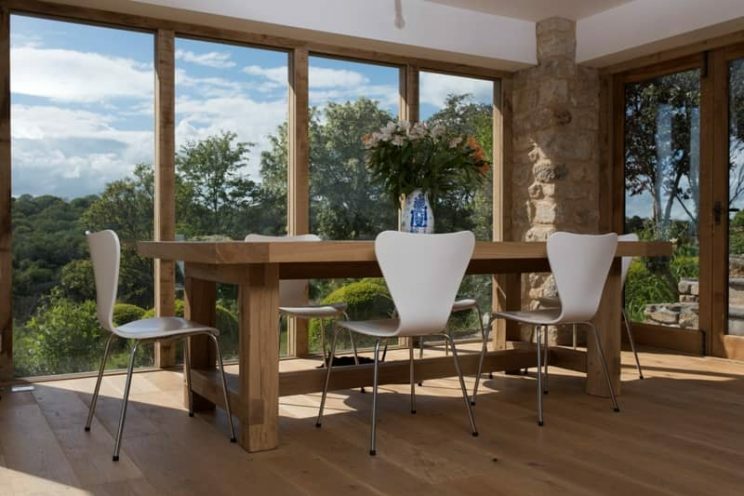 This type of flooring solution works really well with underfloor heating systems. 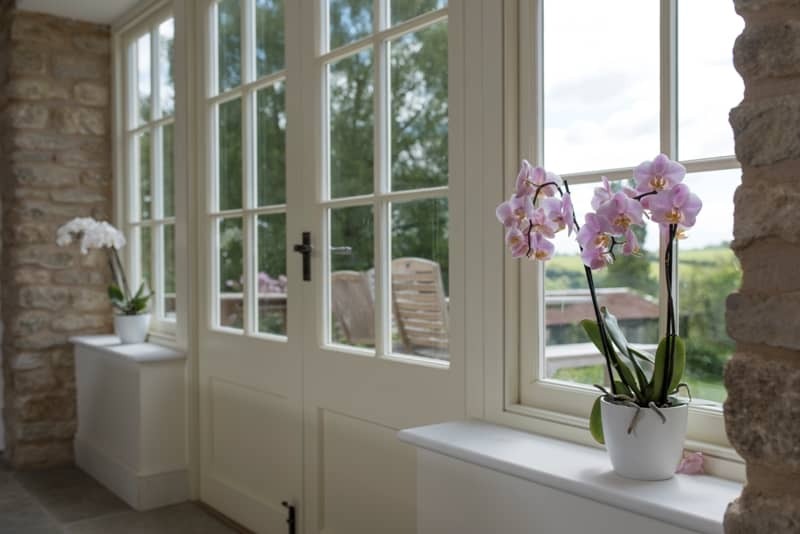 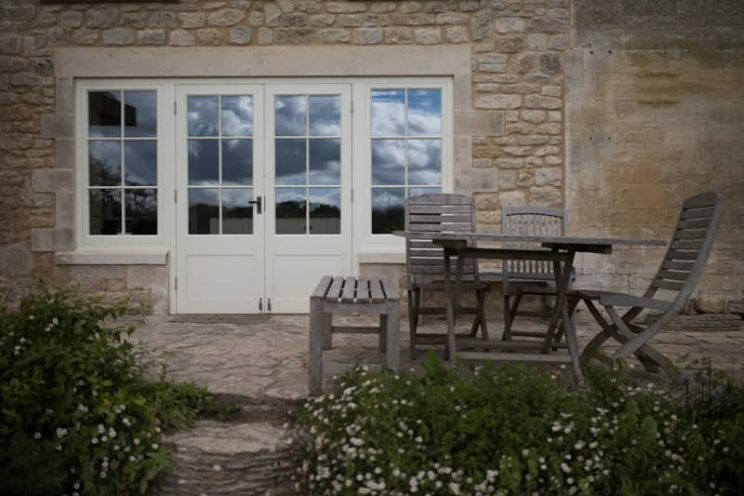 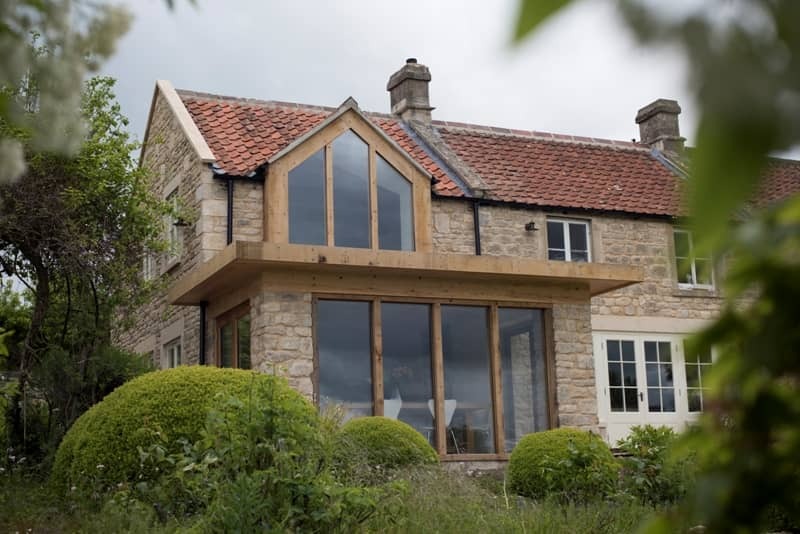 Heat-proofing for the winter months is always a serious consideration when adding a glass extension, so the family opted for high spec double glazing to draught-proof their rooms. 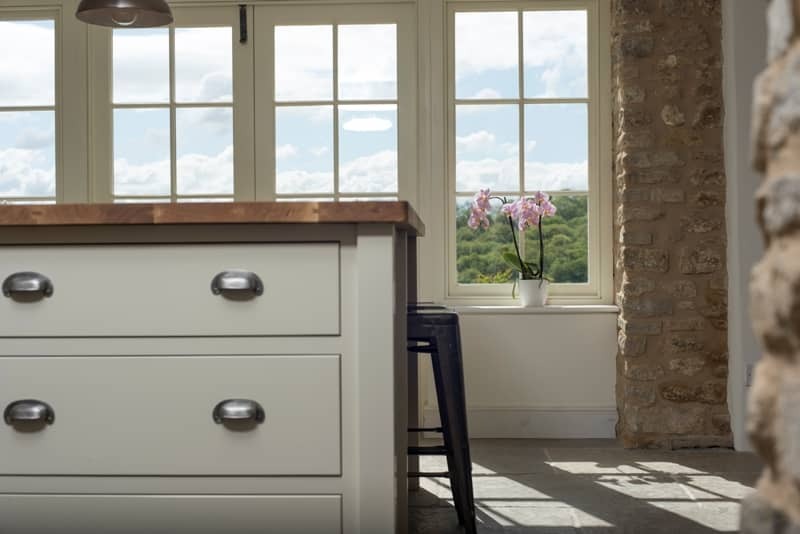 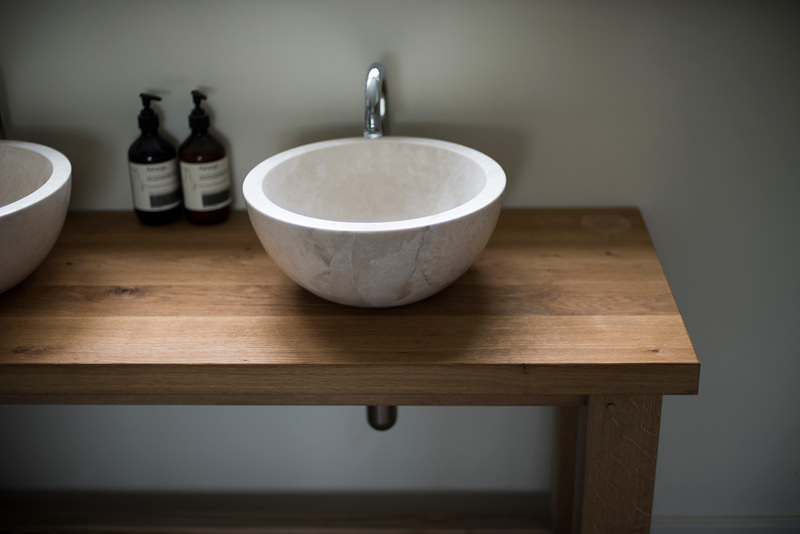 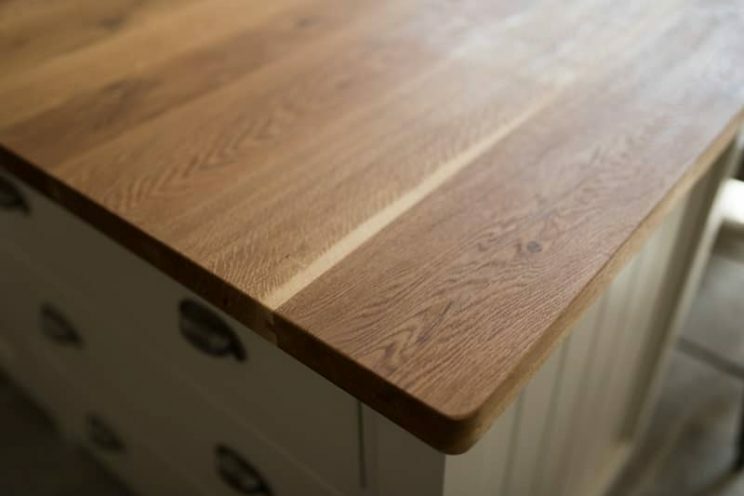 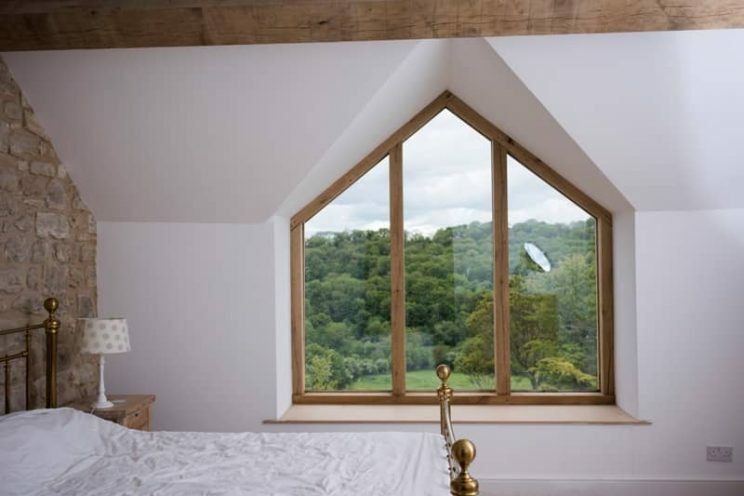 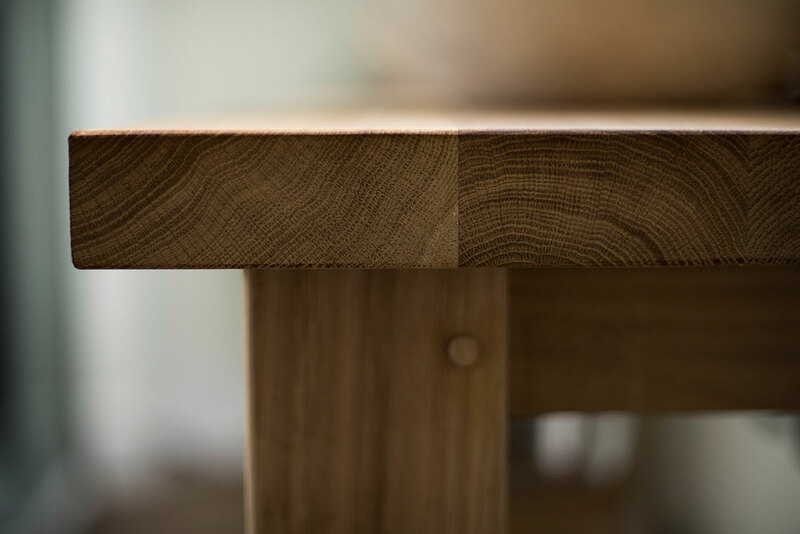 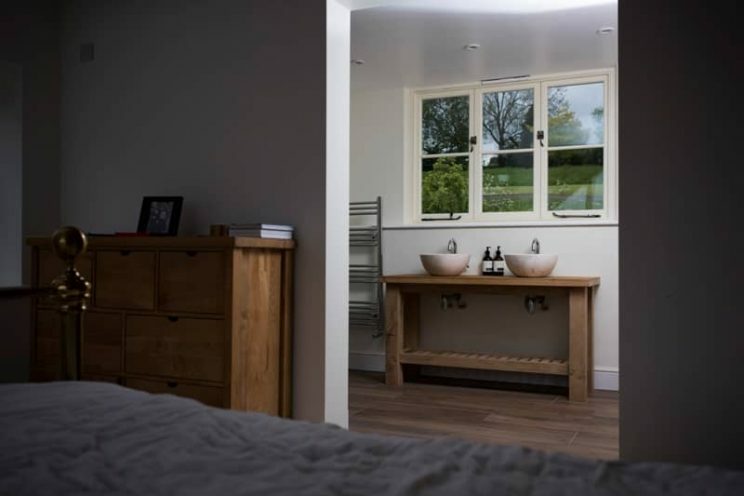 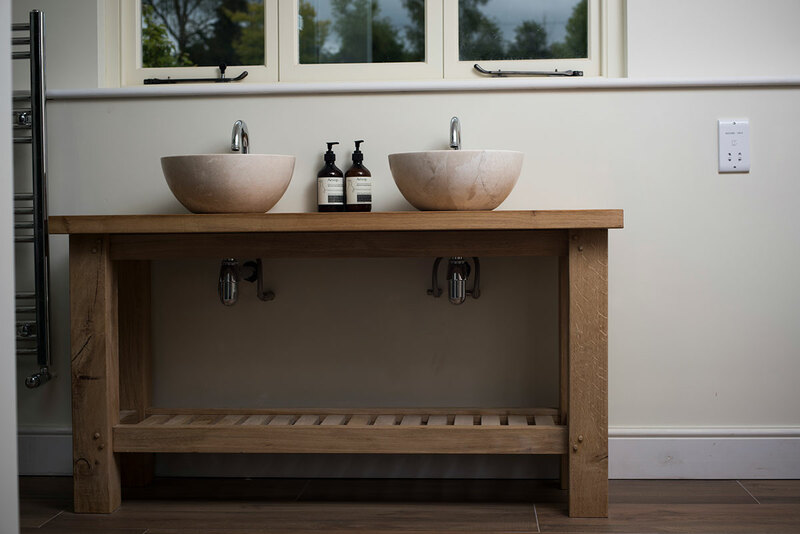 Upstairs we were tasked with creating the master bedroom gable end window from fresh sawn oak, and a contemporary twin sink oak stand or vanity unit. We really love the flow of textures and light throughout this open plan house – plenty of glass to make the most of the amazing views, honey coloured exposed stone next to rustic fresh oak and zinc roof materials. 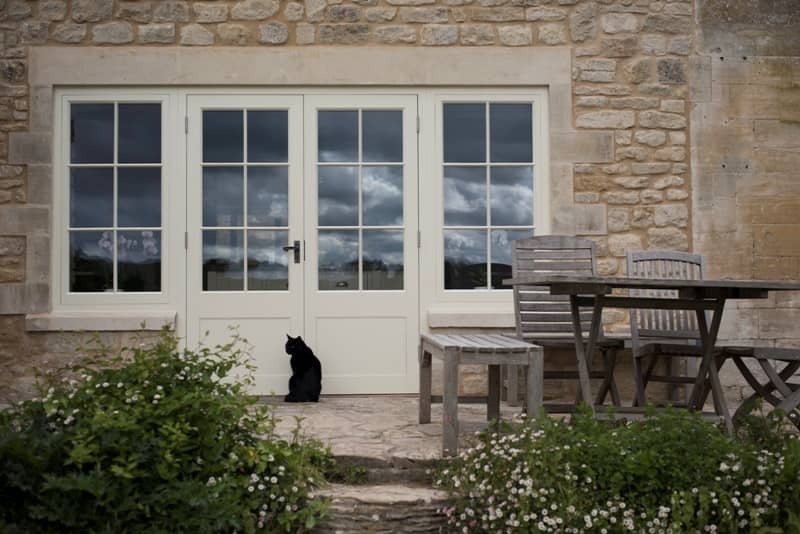 All our painted joinery was finished before it left the workshop for fitting. 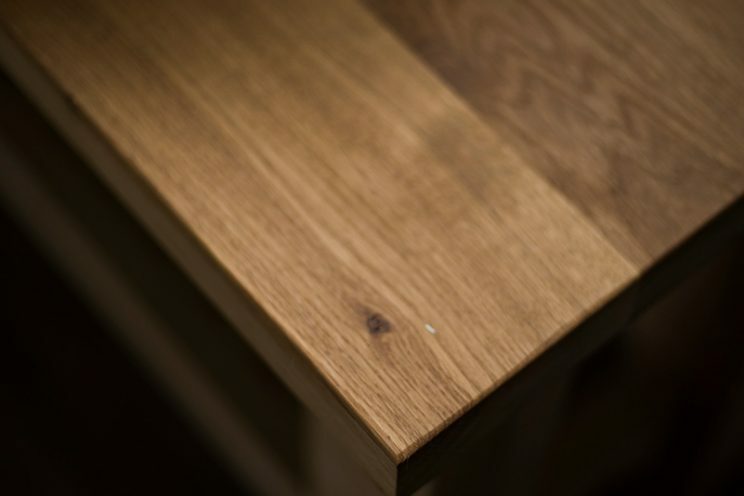 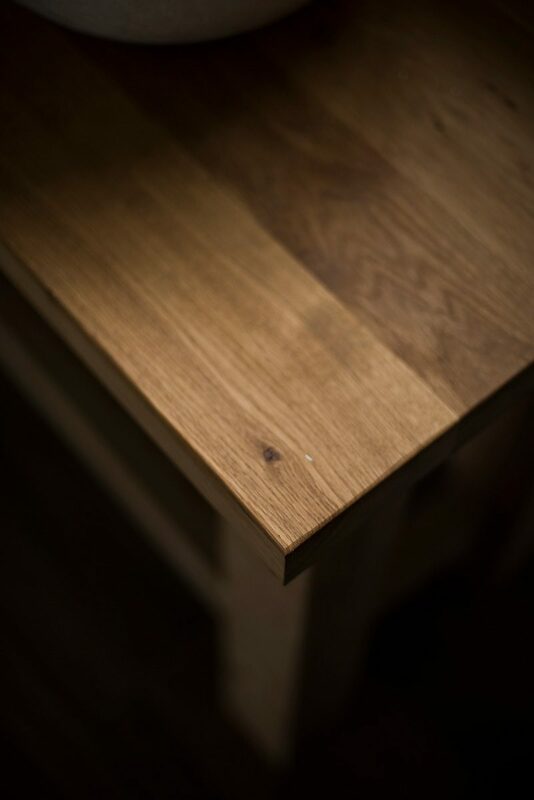 We have a spray facility here and use microporous paints which allow the wood to breathe. 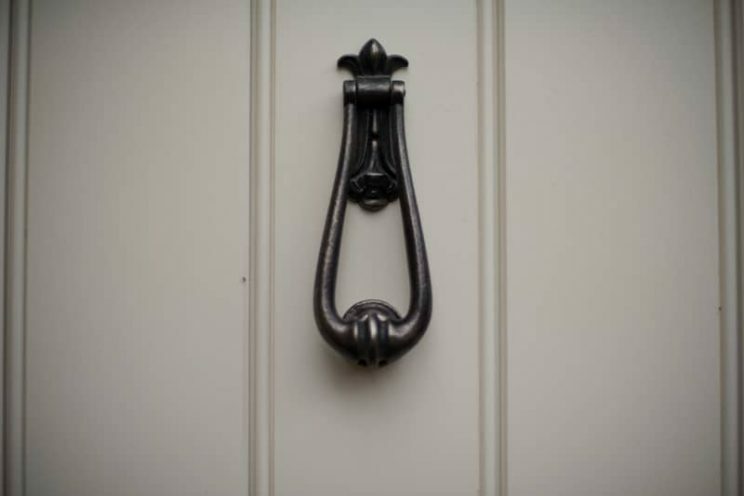 We are big advocates of these particular paint systems because they’re eco-friendly, durable and long lasting. 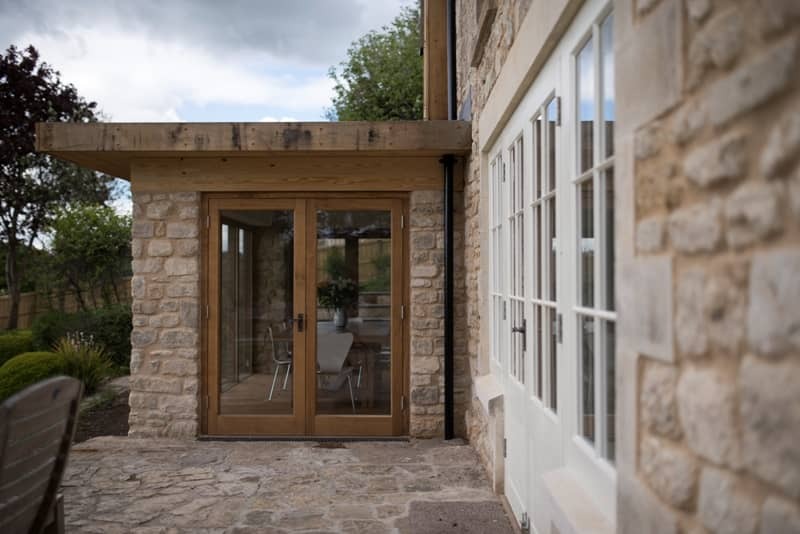 This was a really enjoyable project carried out by some key members of the Bath Bespoke team: Arkadiusz, Ollie, James and Manuel. 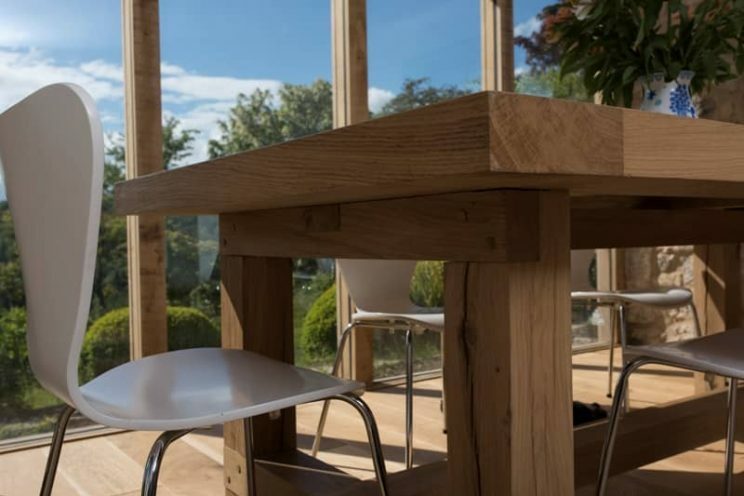 We finished installing all our elements of this five-month-long project in April 2105, just in time to enjoy the arrival of the Spring sunshine.